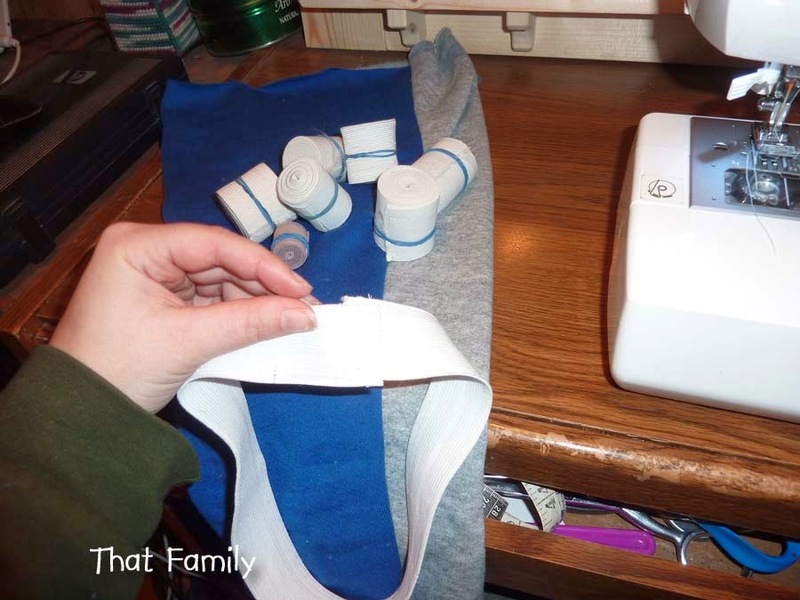 Today, as promised, you're getting a peek into my method of sewing toddler pants. 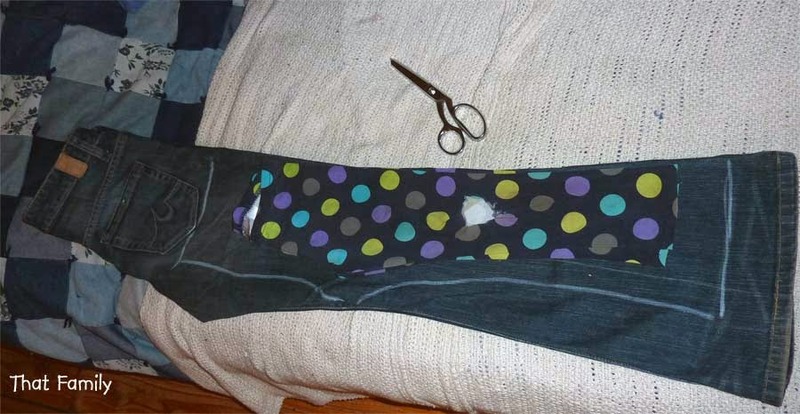 In the beginning, I followed a pattern with moderate success and got locked into that singular mindset of how to construct a pair of pants. 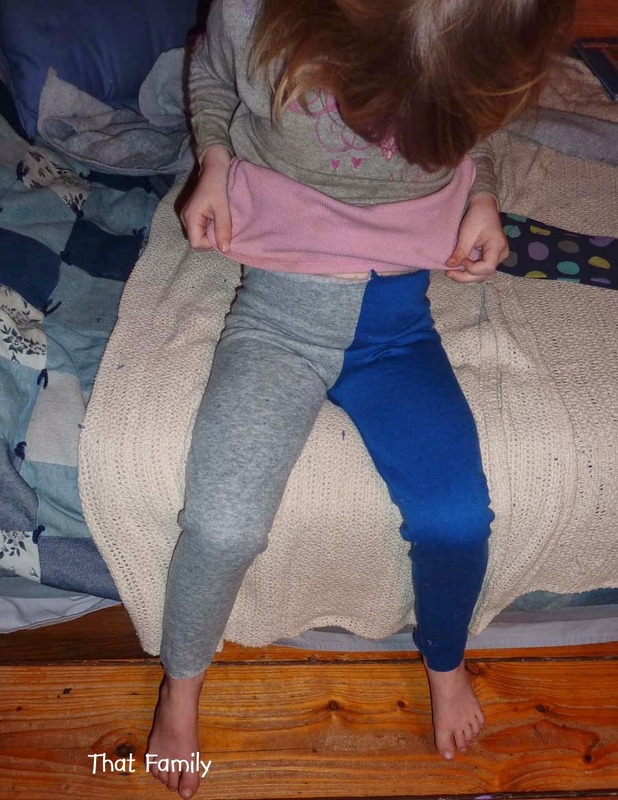 Turns out, there are lots of different ways and by letting go of that method and trying some others, I landed on one that's easier and I use most often for kids pants. 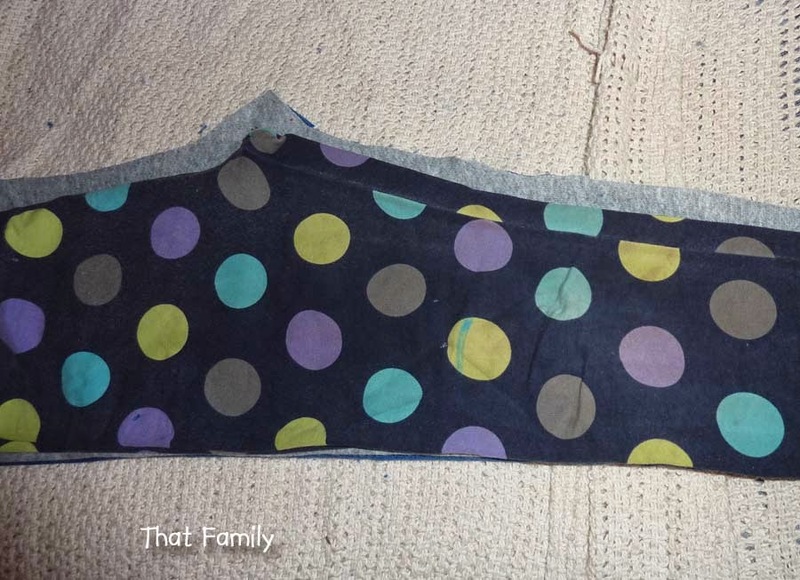 First, I grab a pair of pants (in this case leggings, because that's what I'm making) that I know fit my tot well to use as a pattern. I've measured and made paper patterns for Donna before, but she's changing sizes so often now, I've found it's easier to just nab something that I know fits and cut around it. 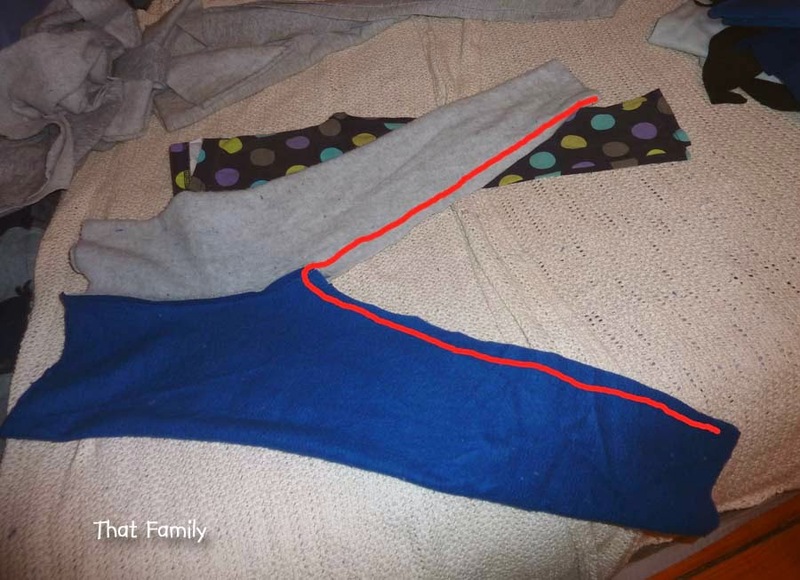 Fold your material in half, one fold for each leg, paying attention to were the stretch is (red arrow) because these are leggings and they're going to be fitted. I'm using blue and grey for each leg so you can clearly see my two folded layers. 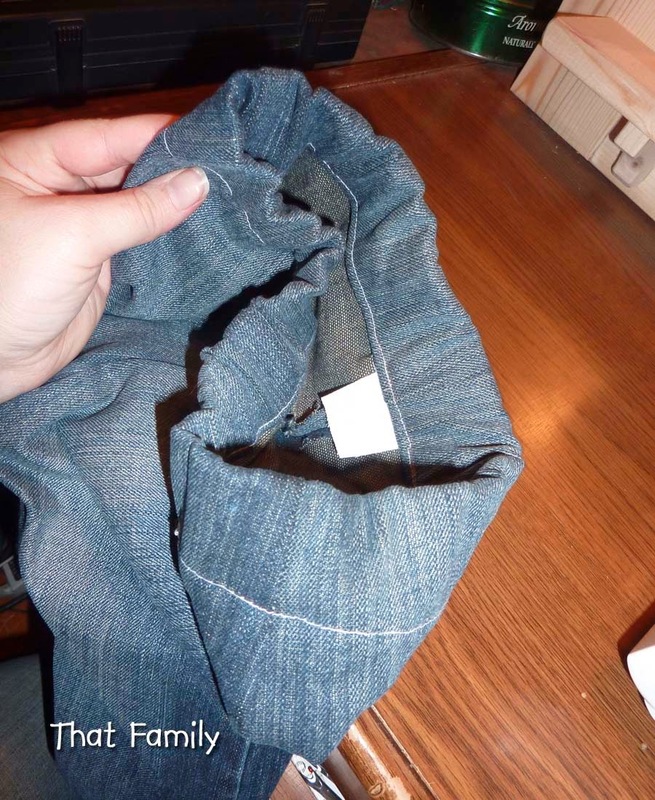 Fold your pants (pattern) in half and line up the outside length of the leg on the folded edges. Cut around the pants eyeballing a guesstimated seam allowance. Don't be super picky here. If I'm making something amazing (haha), I'll pin and measure my seam allowance, maybe mark it out with chalk, yaddi, yaddi, ya. 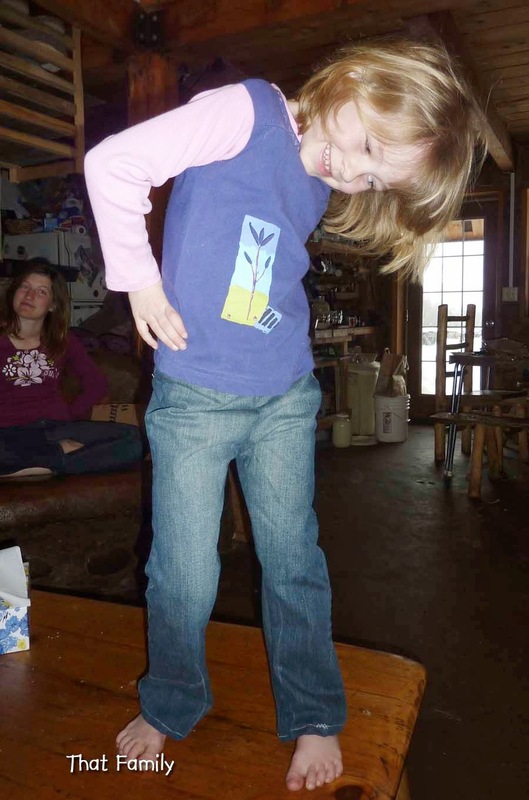 For kids clothes, it's snip, snip, snip! Make sure you leave 2-3 inches (depending on the width of the elastic you're using) at the top of the pants for folding down the waistline. (If you're short on fabric and can't swing that, you can always add a waistband later, but it's more time consuming.) Also note that for this one, I enlarged the legging pants pattern (again by eyeballing) because these are jeans and needed to be roomier. 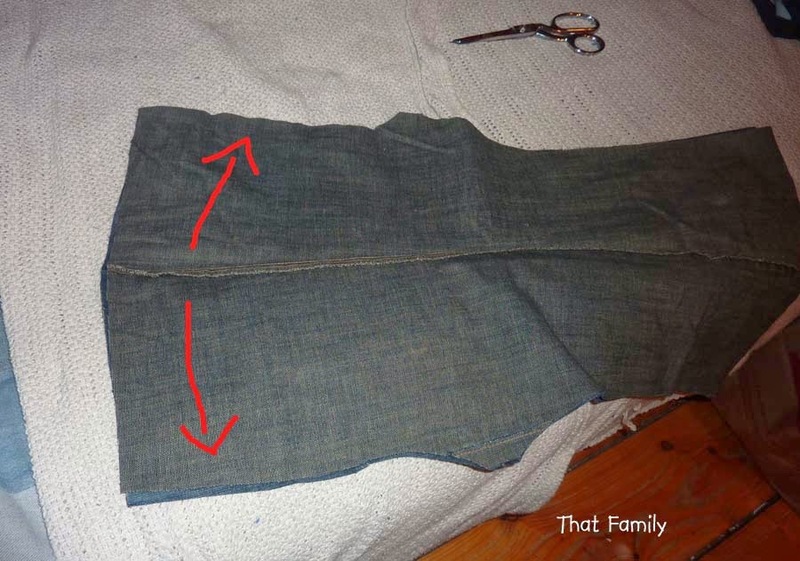 Fold open, right sides together, and sew along the red lines. Put the legs right sides together and sew up the red line. Inside out and try on (note the extra tall waist at this point). Measure a piece of elastic. It should be slightly stretched without causing any discomfort. 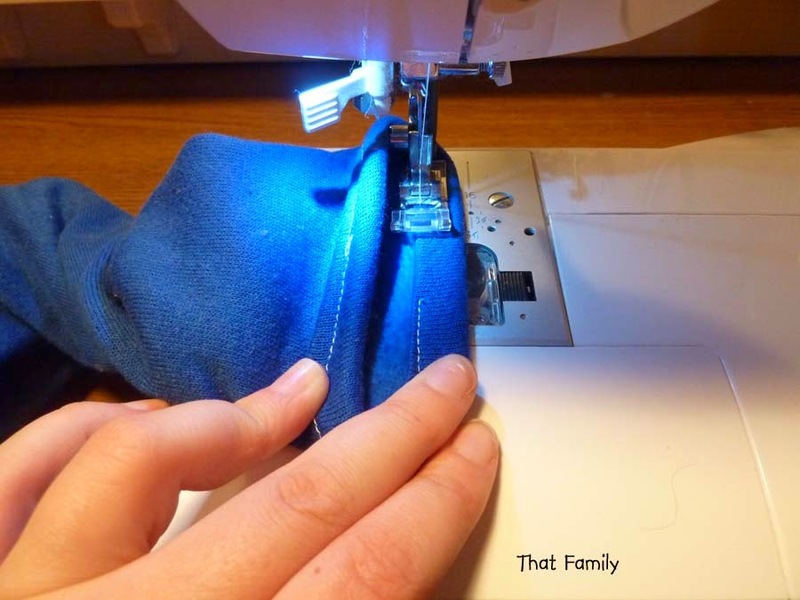 Sew elastic into a closed loop. 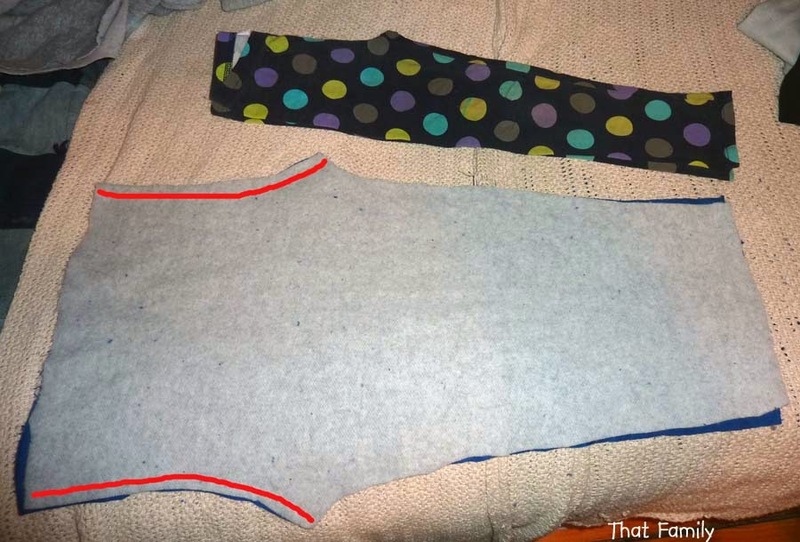 Fit them into the top of the waist so that the material just overlaps the elastic by a seam allowance. Stretch the elastic to fit and stick four pins in. Zig zag (for stretch) around. 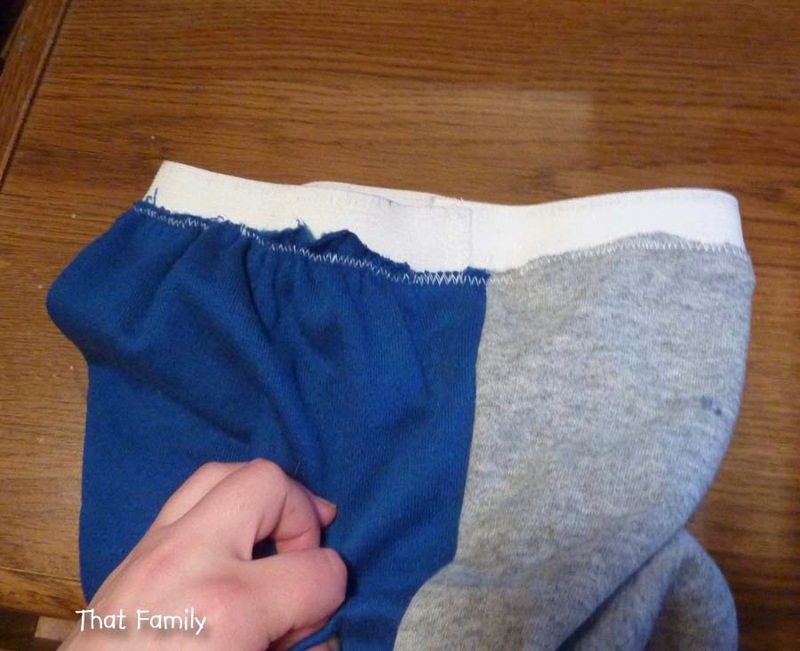 Fold the elastic down into the pants twice so it is completely hidden and run around with a straight stitch. 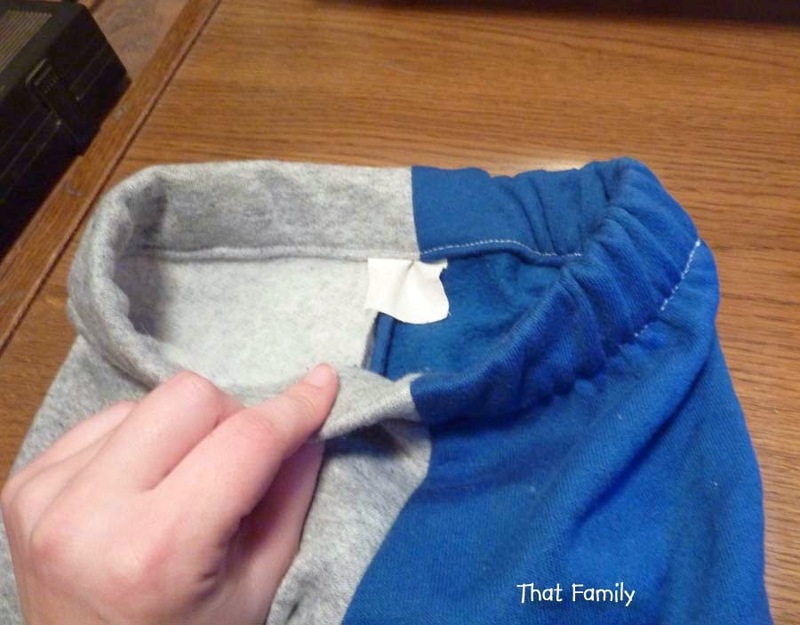 Remember to quick add a tag in the back before sewing this closed! 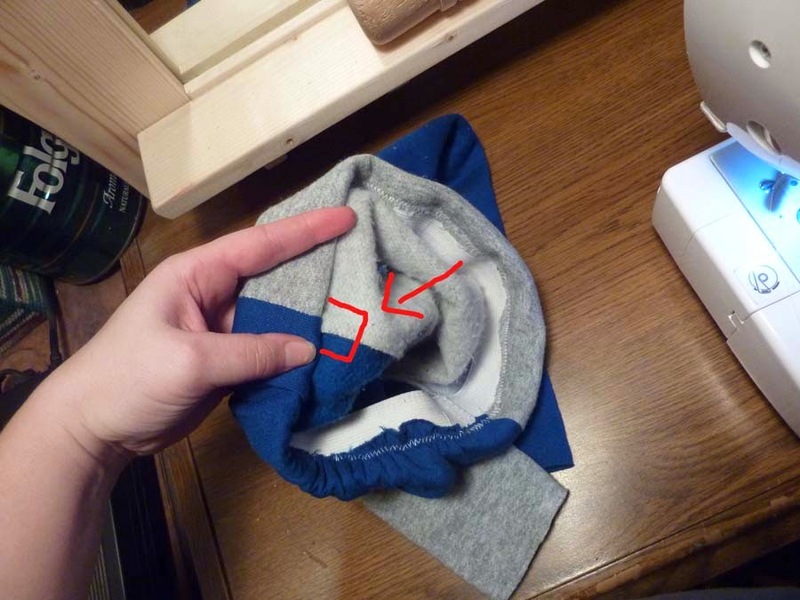 I do a boring double folded hem on the bottom of the leggings, and done!! ..making an extra wide waist area. I ignore this and proceed as usual to the fitting stage. Here I can guesstimate how much needs to be taken off those edges. Looks like an inch or so taken in on both hip seams should do it.